The 40th anniversary of the events of 1968 was marked in 2008 by a resurgence of interest in the phenomenon and, ever since, there has been a wave of activities across the world that have celebrated the peaks of creativity and political activism that flourished in the surrounding years. 1968 was not just an event situated in the West, but parallel equivalents emerged simultaneously in many corners of the globe, Japan being no exception. What differentiated Japan’s 1968 was that it was situated in the wake of a failed revolution against ‘Anpo’, the renewal in 1960 of the US-Japan security treaty, which was vehemently opposed by the Japanese populace. For the Japanese, the 1960s were a decade that was defined by disenchantment and by a reinvigorated and necessary urge to focus on the issue in preparation for the treaty’s next renewal in 1970. The artists of this generation, many of whom grew up in a Japan devastated by the war, acted on their impulse to use artistic expression to contribute to the climate of social protest and avant-garde activity. The screenings organised in London in the coming months, namely Close-Up Film Centre’s July season, Theatre Scorpio: Japanese Independent and Experimental Cinema of the 1960s, and the BFI Southbank’s August season, Shinjuku Diaries: Films from the Art Theatre Guild of Japan, demonstrate the best of Japanese independent cinema in the age of cultural and political revolution. The programmes have been put together to counter the traditional auteur-driven notion of cultural productivity. Instead, they focus on the era’s creative spirit, which permeated the arts community. Close-Up’s Studies in Movement: Experiments by Three Filmmakers programme will screen Hausu director Nobuhiko Ôbayashi’s early shorts and New Wave titan Nagisa Ôshima’s photo-collage film Yunbogi’s Diary alongside collaborative experiments by a student collective, the young filmmakers of Nihon University Film Studies Club. The programmes intend to dismantle the boundaries that have been set up between experimental cinema and narrative features to prove the two modes of expression and their practitioners continuously infiltrated one another. Katsu Kanai, who will be visiting the UK for the first time to introduce his Smiling Milky Way Trilogy, was one of the key filmmakers of the period. He was able to merge fiction and reality, narrative and visual poetry, in a way that revelled in a joyous desire for experimentation. A nun with a machine gun and a man giving birth to his doppelgä;nger from his wounded back are just two out of many images that you will never forget. 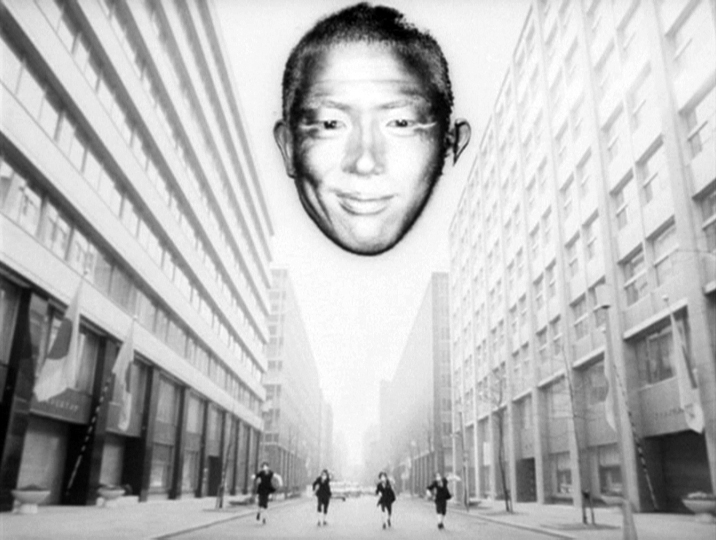 Masao Adachi’s Galaxy, screening with English subtitles for the first time, is a masterpiece of surrealist filmmaking, where a sense of narrative melts into the protagonist’s subconscious. The inaugural film at the Theatre Scorpio, an underground art space where dance, theatre and screenings took place, Galaxy was instrumental in launching Adachi’s career as a scriptwriter and pink director. This is where he met his long-term collaborator, KÔji Wakamatsu, who walked past the venue in awe at the queues around the corner, and immediately got in touch with Adachi. The venue quickly became a focal point for all corners of the art scene and a space where artists shared ideas and established collaborations. Close-Up’s film programme is in celebration of this influential theatre, its name given by Yukio Mishima in tribute to Kenneth Anger‘s Scorpio Rising. Located above Theatre Scorpio was the Art Theatre Shinjuku Bunka, the centrepiece cinema for the Art Theatre Guild, where a range of foreign art-house films, by directors from Glauber Rocha to Satyajit Ray, and from the Polish New Wave to world cinema classics, were screened to large crowds. One of ten ATG cinemas that were established across the country in 1962, the venue screened films ATG distributed and, from 1967, local independent films that the organisation helped to finance as co-producers. The space was also used for jazz concerts, rakugo comedy and late-night angura theatre. The BFI season in August showcases the early period of ATG productions with their 13-film programme, which includes films by luminaries of the Japanese New Wave, Nagisa Ôshima, Shûji Terayama (whose films will be screened at Tate Modern in March 2012), Toshio Matsumoto and Masahiro Shinoda, alongside prominent titles by lesser-known directors such as Kazuo Kuroki, Akio Jissôji and Susumu Hani. ATG continued to support productions until the late 1980s, a later period that is currently placed under the spotlight in a full-scale retrospective at the Maison de la culture du Japon in Paris. Perhaps due to the interactive nature of the art spaces, where films were placed alongside other arts, the featured titles in the programme have become invaluable records of theatrical happenings and the visual arts scene, as well as testaments to the existence of a participatory environment that unabatedly crossed disciplines. The ATG encouraged prominent playwrights, graphic designers and composers to take part in the production of film: famed graphic designer Kiyoshi Awazu took charge of the art design of Double Suicide; Terayama scripted Inferno of First Love; theatre directors Kunio Shimizu and Jûrô Kara took on film directing; and Tôru Takemitsu, Yasunao Tone, Toshi Ichiyanagi and Takehisa Kosugi (whose work is exhibited at Spitalfield’s Raven Row Gallery until July 17) all provided radically innovative soundtracks for films of the period. The importance of the art spaces will be the focus of a free two-day symposium at Birkbeck College (July 30-31), an event that will include a talk by Katsu Kanai and keynote speeches by curators Go Hirasawa and Roland Domenig, as well as three UK premieres of rare films from the period. Performance art and live art were documented on film, yet in characteristic approaches that emphasised the director’s personal vision rather than clarity in documentation. The infamous ‘rituals’ performed by Zero Jigen feature in Funeral Parade of Roses and The Deserted Archipelago, and Terayama’s theatre troupe Tenjô Sajiki appear in his feature-length ATG films and Double Suicide. Motoharu Jonouchi, an experimental filmmaker whose work is the subject of an entire programme in the Close-Up season, participated in live art events as a collaborator-filmmaker. His film Hi-Red Centre Shelter Plan, to be screened at Peckham’s Flat Time House as part of South London Art Map’s Last Friday events (July 29th), records the notorious live art event at the Imperial Hotel in which Tokyo avant-garde figures such as Yoko Ono, Tadanori Yokoo, Nam June Paik and a naked Masao Adachi participated. Jonouchi’s butoh dance film, Tatsumi Hijikata, which captures the co-founder of butoh dance’s contorted choreographies frame by frame, will also feature in Close-Up’s programme. Kazuo Ohno is the other leader of butoh and his flamboyant costumes will be displayed in an exhibition at the Victoria and Albert Museum this autumn. Both feature in Takahiko Iimura’s Cine-Dance films, screened as part of the BFI’s Essential Experiments strand, together with Yayoi Kusama’s body paintings, which feature in her film Flowers; her work will be the subject of a major exhibition at Tate Modern in January 2012. These seasons, brought together especially for UK audiences, testify to and take part in a renewed interest around the world in Japan’s counterculture of the 1960s and early 1970s. The screenings and events are an exceptional opportunity to encounter these rare works of art, as many of these films are unavailable on home-viewing formats even in Japan. All screenings are accompanied by an introduction by the curators, filmmakers and experts in the field, who will provide a platform for discussion. If you thought 1960s Japan was only about Ôshima, think again; Japan’s avant-garde had many faces, and the screenings will provide vital occasions for an introduction to the exhilarating explosion of creativity that was the post-war Japanese art scene.